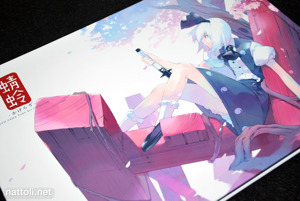 During Comiket 76 Ryo Ueda released a compilation of the Touhou art work that was done primarily for C-CLAYS titled Tonbo. Considering the pieces in this collection were only previously available on more expensive items like stick posters and CDs, it's great to finally be able to have it all in one place. Only interested in the pictures? Skip the reading and click here for a slide show of all the images. Tonbo (蜻蛉) is hard-cover, A4 size and opens long-wise, creating a very unique presentation for all the illustrations. Since a lot of the illustrations were originally stick posters, this format is perfect because the image are able to be presented in full, without being too small to appreciate the details. 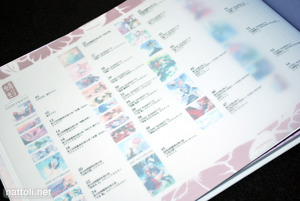 Even the index page at the beginning of the book has been done in a unique way; the text for the information about each image is printed on a piece of see-through rice paper, and it matches up with the page of image thumbnails underneath. The sections are arranged by year, 2006 through 2009 with the newest illustration at the front of the book and the older ones at the back. Also, the first two images in the book (pictured above) are both new and exclusive. And even though it's hard cover, this book is so well bound that you can open it all the way, and see the images in full without losing any of the image to the binding. It's really impressive, especially if you've seen hard cover art books done the wrong way. You can see in the photos that the pictures line up perfectly from page to page. The content is really spectacular, mostly because each piece of art work was essentially being sold on its own in the first place, as posters or CDs and the like. So none of the images feel like filler. Even though the art work is arrange in time order, Ryo Ueda's illustrations from as far back as 2006 are still as beautiful as the ones from 2009. 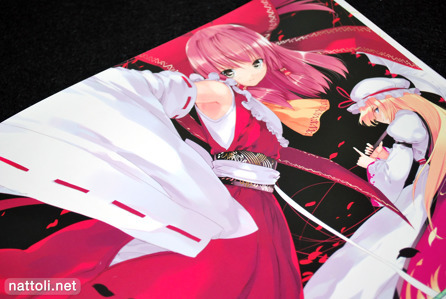 I think Reimu Hakurei and Youmu Konpaku show up the most in this book. I wonder if Ueda's picked his favorites, or if they're just most popular among the fans? 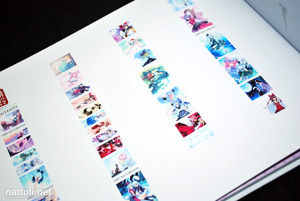 The book ends with the 2006 illustrations from Comiket 70 and 71. I really have to say, I found most of the older works to be my favorites, though everything is top notch. Tonbo is 70 pages long, of which 54 pages are in color. The monochrome pages are just for the sketches behind the illustrations in the book and an interview (amusingly titled "Long Interview") with the artist himself, Ryo Ueda. Books like this really can change your opinion on doujinshi, when you see how high quality a self-published collection like this can be. Lots of full color ^_^ Those doujin guys really know how to treat you! Right now your best bet is Yahoo Japan Auctions. During the time around Comiket, it was really on sale everywhere, but it may come back around the time of the Winter 77 Comiket. 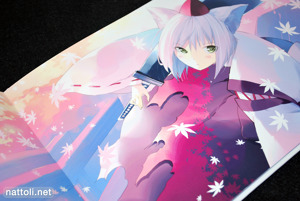 A lot of artists will re-print a few more copies to sell at later Comikets. Wow, how on earth did you get past the ''bidding'' area or even the checkout, where you have to pay...for me it was like nightmare, didnt manage to complete it *sigh. *following you on twitter. I am in your debt! ^__^ thank you very much for helping. now hopefully nothing come in my way this time. im sure you watch anime dont you? And of course I watch anime! Anything in specific? Well i just reckon youd have a MAL account.http://myanimelist.net/dont know if you know it. oh like keys anime, or bakemonogatari, shuffle etc. This crescent shop is very Very Helpful its way easier like 08973807 more. lol i already have tons of things in mind. 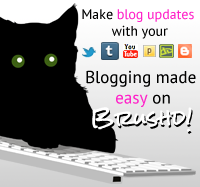 but i guess first ill have to get some C-clays work, since by looking at your blog looks amazing. do you regularly use that? the thing is i wonder how much is shipping and how long,, the usual questions youll ask. I use Crescent-Shop and Goody Japan the most. Goody Japan is cheapest when I plan on buying direct from a store (and only one store) but their interface isn't as detailed as Crescent Shop, especially with auctions. Plus the Crescent Shop group is really great with communication, and very accommodating to changes in orders, plus they give you your total (without shipping) before you decide to pay, so you can edit it if you want. I always do EMS shipping, so it's a bit expensive (around $40 for 5-10 books + doujinshi). If you make a request to buy something from a store, they usually have it within the week, and will ship to you the following week. And if you use EMS, you'll get it that same week, so it's pretty quick. Well MAL is great libraby to keep up with recent-old anime or manga, so why not create one. I just ordered 1 c-clay product, with stick poster, oh and i used crescent shop, it does look way easier than goody japan, well the auction interface. i just won a succesful bid, so i wonder when it will be finalise. hopefully sooner or later, but i dont mind, as long as i get it. oh but the thing i didnt really undertsand was the deposit, but i guess its ok now.